Twenty-eight people have been taken to hospital following two crashes involving a small coach and six vehicles on the M4 near Cardiff. The road was temporarily shut between junction 33 Capel Llanilltern and junction 34 Miskin after two accidents on both sides of the motorway. A woman was airlifted to hospital and another 27 people, mainly pensioners, were taken by ambulance. Three hospitals across south Wales dealt with the casualties. Traffic queued for miles after the 11:50 GMT crash. Some disruption on the motorway and roads leading to it should be expected, according to Traffic Wales. 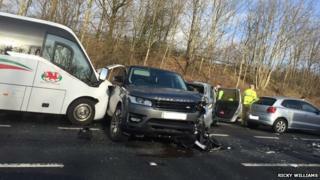 South Wales Police said the first accident happened after the coach - taking pensioners from Maesteg to see the Top Hat musical in Cardiff - collided with four other cars on the eastbound carriageway. The most seriously injured person was flown to Cardiff's University Hospital of Wales (UHW) while the others were either taken to the Royal Glamorgan at Llantrisant or the Princess of Wales in Bridgend. Most were walking wounded but six were more serious. However, none are believed to have life threatening or life changing injuries, police said. The Princess of Wales Hospital urged people to avoid its emergency unit as it dealt with 13 of the casualties, who were mainly women. A spokeswoman said nobody was seriously injured. A few minutes after the first crash, a vehicle towing another one overturned on the westbound carriageway but no-one was injured. The 27 year old from Swansea was driving westbound when he saw the crash happen. "All of a sudden I saw on the other side (of the road) a lot of queuing stationary traffic to go up to the sliproad," he said. "Then the minibus went into the back of a car, the car then went into the back of a Range Rover and that then went into another car, which spun out and scrunched." Mr Morley immediately pulled into the hard shoulder. "I jumped over the barrier and a woman in the car which spun out was breathing but unconscious. But I got her to come round by talking to her and doing what I'm trained to do," he said. "An off-duty nurse then took over from me while I then helped other walking wounded. "It was crazy and surreal." Mr Morley said two air ambulances attended and one took the injured woman to University Hospital of Wales (UHW). "There were children standing on the side of the road, they had been in the cars caught up in it," he said. "The minibus was full of pensioners and I think they were on their way to see the musical Top Hat in Cardiff. They were mainly walking wounded with some significant cuts and bruises." Eyewitnesses caught up in the disruption said traffic was gridlocked following the crashes. Cory Richards, 20, from Swansea, saw a 29-seater coach crash into the side of a Land Rover, which hit the car in front. Tom Stoneman, 25, from Llanelli, added he saw lots of walking wounded. "I saw five cars involved, a big Land Rover and Corsa were in the middle of the motorway with a lot of damage and facing the wrong way." Craig Lewis said he was stuck for two hours between junctions 34 and 35. BBC producer Margaret Keenan, stuck in traffic for more than an hour, said: "I could see several people standing by the side of the road, clearly distressed. "There were several ambulances and at least seven police cars." The pensioners were heading to the Wales Millennium Centre (WMC) in Cardiff Bay to see a matinee show of the musical Top Hat. A WMC spokeswoman said many people missed the first half of the afternoon performance because of the crash. "We are extremely saddened that what was to be a lovely afternoon at the theatre for a large group from Maesteg turned out to be such a frightening and shocking experience," she added. Anyone who witnessed the collision should call South Wales Police on 101.